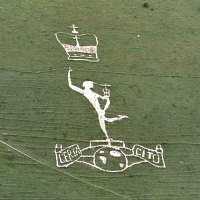 Situated on the Downs of Wiltshire at Fovant remarkable chalk carvings are to be seen. 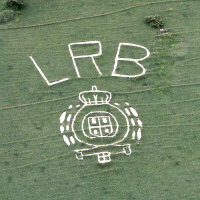 These extraordinary carvings can be observed from the A30 Shaftesbury to Wilton road. It was during World War I (1914/1918) that there was a need to establish training camps for troops engaged in the battlefields of France. 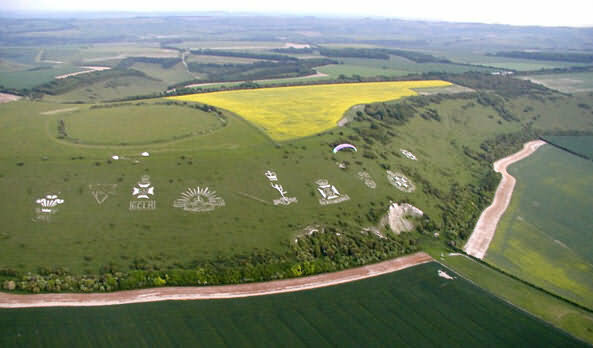 One of the areas chosen was at the village of Fovant and it was here that many thousands of men received their training. The camp had hospital facilities and it was here that soldiers returning from the fighting were treated for their wounds, many failed to survive dying from either wounds or disease. 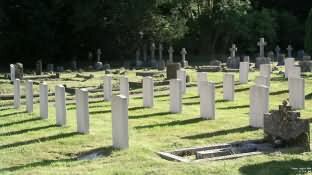 The church of St. George in the village of Fovant has rows of war graves of British and Australian soldiers and it was to the memory of those who had died that the Regimental Badges were carved by their comrades. Many of the original carvings failed to survive the elements and at the end of world war I there were 20 identifiable badges. During World War II, the badges were allowed to overgrow in order that they could not be used as landmarks by enemy aircraft. Following the end of the war the local Home guard formed themselves into an Old Comrades Association and took on the arduous task of restoration. In the years 1948-51 the two Wilshire badges were cut and in 1970 The Royal Signals Badge was added. 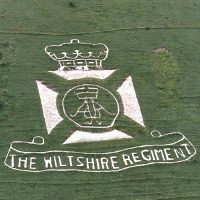 Founded in 1797 and was known as The Regiment of Wiltshire Cavalry. In 1831 the honour of Royal was bestowed. In 1863 a new title was given this was ‘The Prince of Wales’ Own Royal Regiment. It was in 1884 that her Majesty Queen Victoria authorised the table of precedence for several regiments of yeomanry in Great Britain. The Royal Wiltshire Yeomanry was allocated the number one position. The Regimental badge includes The Prince of Wales feathers. Formed in 1860 as the 2nd London Rifle Corps, it's members were mainly employees of the newspaper and printing industries, two complete companies being provided by the Daily Mail. 1881 saw the Corps becoming a volunteer battalion of The Kings Royal Rifle Corps, this was followed in 1900 by amalgamating with The City Imperial Volunteers and serving in South Africa with the title of 6th (City of London) Battalion . In 1908 it became The London Regiment (Rifles). During World war I the 1st, 2nd and 6th Battalions served in France and Belgium and in 1916 the 3rd and 6th Battalion became the 6th (reserve) Battalion. It was in the same year that the ‘Rifles’ became part of The Kings Royal Rifle Corps. In 1935 they transferred to the Royal Engineers as 31 Anti-Aircraft Battalion. It was in 1885 that Major Joseph Maria Gordon, the first Commander at Fort Glandville designed a trophy to symbolise the skill of military defence. It consisted of a series of bayonets radiating out from a semi-circle from a crown. Commander William Rooke Creswell, the commander of naval forces in South Australia and commanding officer of her majesty’s colonial ship ‘Protector’ then undertook the task of having the trophy made. It was in 1902 that Major General Sir Edward Hutton used this trophy as a badge and requested that it was worn by Australian soldiers in South Africa. It was with great pride that these were worn by the Troopers of the 1st Battalion Australian Horse, this being formed after federation. The badge was worn on the familiar ‘slouch’ hat that is recognised the world over and identified with the spirit of Anzac (Australia & New Zealand Army Corps.). 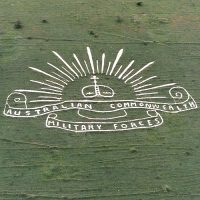 The Australian Government of veteran affairs have been generous in making a grant towards the upkeep of the hillside badge. 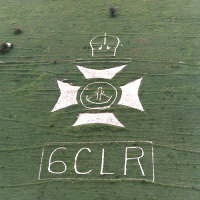 It was in 1870 that the first regular signals unit was formed and was known as ’C’ Telegraph Group of the Royal Engineers. 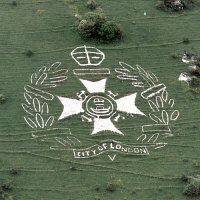 In 1912 it was renamed the Royal Engineer Signal Service. It became the Corps of Signals in June 1920 and six weeks later it became the Royal Corps of Signals. The corps take precedence next after the Royal Engineers . 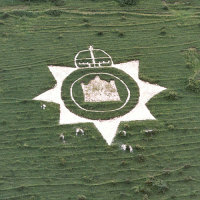 On the corps 50th anniversary in 1970 the badge was cut on Fovant Down. The regiment consists of two former Foot Regiments, the 62nd and 99th which were linked together in 1881 as the Wiltshire Regiment, the 62nd becoming the 1st Battalion and the 99th the 2nd Battalion. In 1948 the battalions were amalgamated and in 1953 Prince Philip Duke of Edinburgh became Colonel in Chief of the regiment . The 1st Duke of Edinburgh had become Colonel in Chief of the 99th Regiment of Foot. 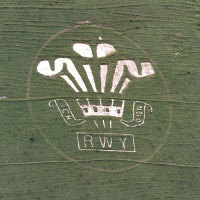 The badge was cut on Fovant Down in 1950 by members of the Home Guard Association with the permission of the colonel of the regiment . First formed in 1859 as the 1st London Rifle Volunteer Corps and quickly grew to be fifteen companies. In 1908 it became the 5th (City of London ) Battalion, the London Regiment (London Rifle Brigade). During the First World War the Regiment served in France and Belgium with a member of the Battalion being awarded the Victoria Cross in 1915. In 1937 another change, the battalion left the London Regiment and designated the London Rifle Brigade, the Rifle Brigade (Prince Consorts Own). The Battalion was divided as 1st and 2nd LRB in 1939 with the 1st becoming a motorised unit then in 1941 was re designated as the 7th Battalion, Rifle Brigade. Following service in Egypt, Libya and North Africa the 7th became a lorried infantry Battalion while serving in Italy during 1944. The 2nd LBR became the 8th Battalion, Rifle Brigade and served in NW Europe throughout 1944/45. In 1947 the title London Rifle Brigade , The Rifle Brigade was again readopted when the 7th and 8th Battalions were merged. It was in 1950 that another title was adopted , this being ‘London Rifle Brigade /Rangers this was after being merged with the Rangers. This Battalion is now represented by part of the 4th (Volunteer ) Battalion ,Royal Green Jackets. This Regiment has it origins dating from 1685 when it was raised by Henry Duke of Beaufort in order to quell a rebellion caused by Henry Duke of Monmouth. In Dorset it was known at that time as The Duke of Beaufort’s Musketeers. Formed at the General Post Office in London in 1868 it was designated as the 49th Middlesex Rifle Volunteer Corps, it was made up of seven companies and recruited from minor staff of the Post Office . Senior staff were already serving as part of the 21st( Civil Service ) Corps. In 1880 The 49th changed to the 24th and in 1881 joined the Rifle Brigade as one of its volunteer battalions. 1882 saw another change, a scheme was approved for the 24th to become the army postal service and for it to conduct the postal duties for those forces on active service overseas. It was 1882 that the newly formed service joined the Expeditionary Force in Egypt and were awarded the Battle honour ’ Egypt 1882’, this made the Post Office Rifles the only territorial battalion to be so honoured. The battalion saw service in South Africa during the Boer War. In 1908 the regiment became the 8th (City of London) Battalion, the London Regiment. It was under this name that they were engaged in active service in France and Belgium during the First World War. In 1916 the 24th became part of the Corps of the Rifle Brigade and following this in 1922 was amalgamated with the 7th London Regiment. In order to maintain and restore the badges, the society needs funds, professional help has to be paid for. Despite contributions from - Heritage Lottery Fund, The Daily Mail and general trust, Pilgrim Trust, The Cloth Workers Foundation, Australian Department of Veterans Affairs and Salisbury District Council further help is needed. For - Index of British and Australian soldiers who died in the First World War and buried at Fovant Church.